Check your body fat composition quickly, easily and accurately with this Portable Body Fat Analyzer. This lightweight tool is the most effective way to see the results of your diet and exercise program. Using this digital body fat analyzer, you’ll be able to monitor your body fat percentage and weight more easily. Its convenient display identifies your ratings in about seven seconds, with clinically proven accuracy. Equipped with a large digital display, you can easily view your results. It can also save up to nine personal profiles and features two modes for athletes and non-athletes. 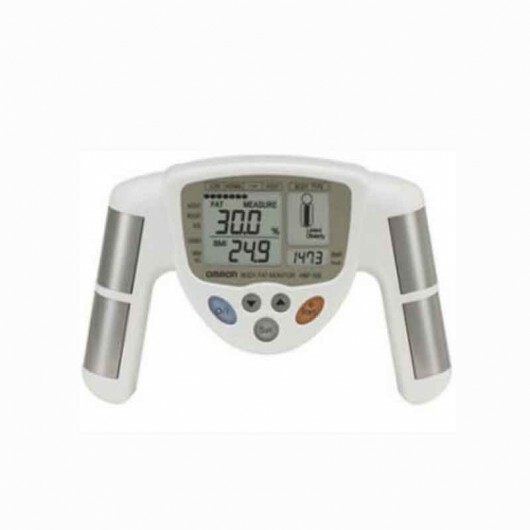 In addition, it is lightweight, ensuring that you can bring the body fat analyzer along with you when traveling for work or play. Handheld device, simply input your personal information and grasp handles with outstretched arms and read your Body Fat Percentage and Body Mass Index in seconds. Two modes for accurate results for athletes and non-athletes. Guidelines provided based on the FIT index (Frequency, Intensity and Time) to determine which mode to use, Athlete or Normal. Measurement results in 7 seconds. Save time with 9 person profile memory. Stores height, weight, age and gender for 9 individuals. No need for constant re-input. Suitable for Height 3′ 4″ to 6′ 6″, weight 23 lbs to 440.5 lbs and age 10 to 80 years old (athlete mode 18 to 60 years old).